Well I had been reading about all problems that others had with this type of equipment and have been thankful that I had none. I've been using the LXD75 for a little over a year and a half and for the most part It's been behaving quite well. However my turn came last week. I had ordered a new set of Encoder wheels from LXD55.com and had replaced the flimsy ones that came with the unit. After a successful install I took the mount out to check out my Polar alignment. The initial setup (two star alignment) went OK as usual but when I parked on a star it just scooted across the field of view, just as if I had the RA motor turned off. I could bring the star back into the FOV but it wouldn't stay there. Slews to other objects went OK but as before the star would leave the FOV in a hurry. Obviously that killed the night as far as any imaging was concerned. The next day I tried all kinds of things to attempt a diagnosis. At first I thought that perhaps the 497 controller was flaky so I rest it and tried again. No good. Next I reloaded the firmware for the 497. That also didn't help. The following day I looked at the RA drive. I brought the Mount in the house and removed the cover so I could observe the encoder and output shaft. I did a fake two star alignment and then noticed that the encoder would move a bit and then stop. I could still hear the pluses being sent to the motor but it didn't move. Maybe the motor is bad? I swapped the RA and DEC motors but it still stalled. OK something is jammed, I thought. I removed the RA motor box from the mount again and placed it o the table. Again I told the mount to go thru a setup which it did but now the RA motor kept on running. No load on it this time. Perhaps the Worm and Drum were binding, I though, but moving the worm gear with my finger it seemed smooth and relatively free. I loosened the worm even more and again tried the motor . No good. One of the people on the Yahoo AutoStar group suggested that I hang the RA motor assembly on the DEC axis and try that. Did that to no avail. After all the testing we came to the conclusion that the RA controller isn't working properly ( I hope that's it anyway). A call to Meade and $150 later I should have the new RA Motor box in a week or two. Meade only sells the complete motor assembly ( motor, control circuit, and plastic housing). For the time being I'm out of luck. Just have to wait. 5-23-09 But wait there's more!!! Meade sent me the replacement RA motor box and I attached it to the mount. It sort of worked but skipped while guiding. After which the 497 gave me a PROC TRAP-2 error each time the RA was suppose to move. I Took the cover off the RA box and turned on the unit and one of the tiny transistors went up in smoke. I think it was the driver for the motor. At any rate. I decided to give to old box another try and to my surprise it worked properly. I don't know why but I had reloaded the firmware on the 497, reset it and calibrated motors. Perhaps one of those resolved the issue. Now waiting for a clear night to check things out. On a slightly different note I would like to share with you what I used to touch up the paint on the OTA of the LXD75. As is inevitable, you will get chips in the paint so I searched around for something to use to touch it up. 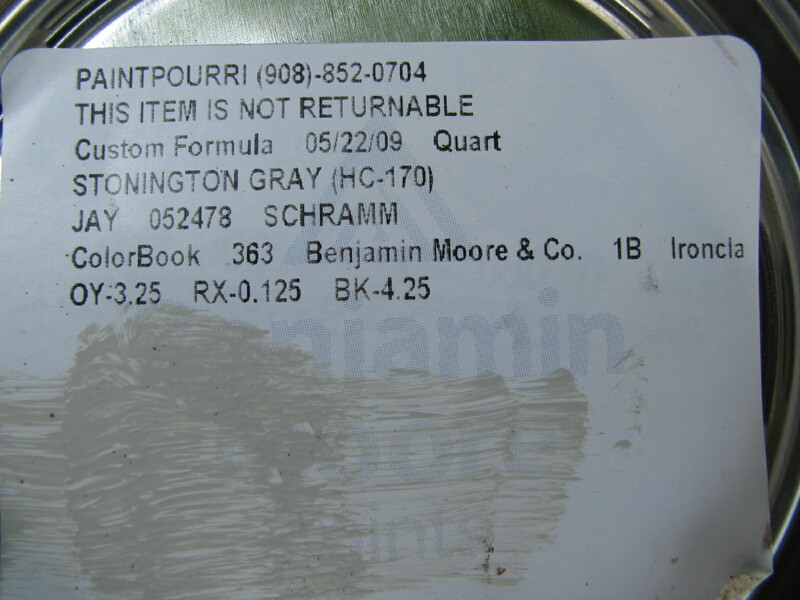 I ended up at my local Benjamin-Moore paint dealer who matched up the color perfectly (Stonington Gray). 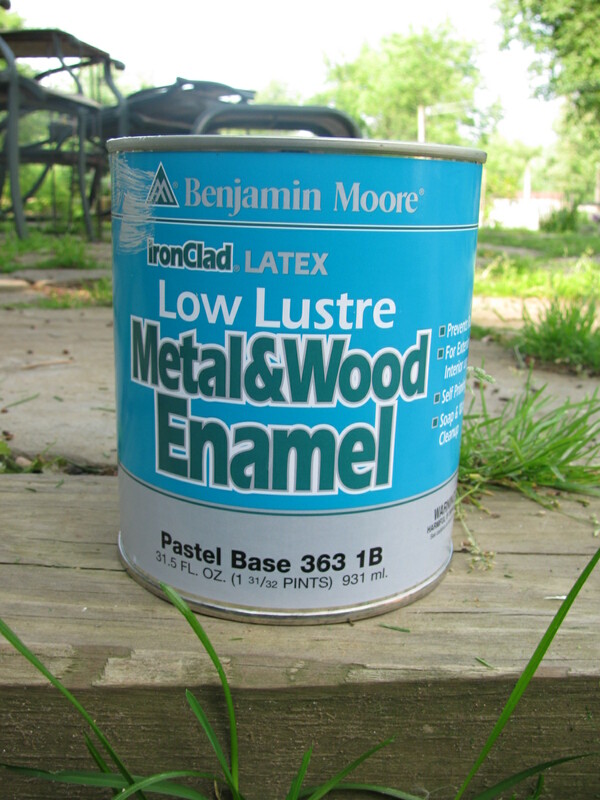 We used the low luster Wood/Metal latex enamel and the following formula. IT goes on a bit light but when dry it matches perfectly. Now what to do with a quart of Stonington Gray? I only needed a few ounces. Oh well, Such is life!